In June 2015, Pope Francis published his encyclical letter, Laudato Si, drawing on the inspiration from his namesake St Francis of Assisi to issue an appeal for the protection and conservation of the environment. Climate activists were delighted, and convinced that this was going to transform the climate debate and lead to global climate action. Pope Francis’ unequivocal call to arms will reverberate globally in acting on climate change, declared Climate Home. Later that year, in September, the Pope visited the US and spoke to congress. In his speech, he didn’t mention climate change explicitly, but again enthusiastic self-deluding environment correspondents convinced themselves that he did. A new paper published in Climatic Change surveyed US Catholics and non-Catholics, asking them how worried they were about climate change, what their political leanings were, and if they were aware of the pope’s encyclical. The results showed that the pope’s message had no overall effect on concern over climate change, either in Catholics or non-Catholics. But there was an effect: increased polarisation. Those on the left who were encyclical-aware became more concerned about climate change, while those on the right became less concerned. The key figure is here. So well done Pope Francis for increasing division in society. There’s a sober write-up of the findings from the institute of one of the researchers here, and a less rational one here from climate activist Megan Darby who seems to have invented the idea that “Right-wing Catholics attacked Pope Francis’ credibility”. Tags: communication, hype, propaganda, public opinion. Bookmark the permalink. I suppose as the leader of Roman Catholics Pope Francis feels a great deal of affinity for the believers in CAGW. Why the leading figure in Christianity giving support to climate activism has lead to increased polarisation should be obvious. For Roman Catholics who do not believe in climate alarmism, there is a conflict created between their scepticism (maybe based on their understanding that climate policies are both useless and adversely affect the poor) and the teaching that the Pope has supreme and divinely-inspired authority. This is especially true when both catholic and anti-religious activists combine to tell them where their loyalties should lie. The other side is the half of the Christianity that is non-Catholic (Protestants, Orthodox, Anglican etc.). For those who reject climate alarmism and are antagonistic to the Roman Catholic Church, it is confirmation of their beliefs. In the Protestant tradition the ultimate authority lies in the Bible, not in a person. It was the clear divergence between the consensus opinions & practices of the Medieval Church and the Bible that lead Martin Luther and others to split from the established Church. There are obvious parallels here with climate. The climate believers increasingly promote their ideas on common beliefs (the climate consensus) whereas sceptics look at the increasing disparity between beliefs and the real world. I think it is fair to say that the modern, reasonably-educated Catholic takes a more balanced view of the Pope’s pronouncements than you might imagine. I have no wish to delve too deeply into the theology of the matter but Francis’ view on climate, like his views on Brexit (assuming he has any), or the US presidential election or the price of fish are purely his own. As one popular theologian put it several years ago Christ does not micro-manage his Church and all he ever promised was that popes speaking on matters within their remit (ie on matters of faith and morals) would be protected from error. He added that forecasting the winner of the 3:30 at Market Rasen was not part of the remit though possibly advising against excessive gambling could be in some circumstances. You may be a believer or not, but that in essence is the Catholic Church’s position. Francis can say what he likes about global warming or any of the other things I mentioned above and the number of people who will pay much attention is vanishingly small when like me, and others, they have taken the trouble to find out the facts for themselves without “assistance” from the likes of Schellnhuber who is hardly the sort of objective advisor one would hope that any religious or political leader would be listening to. On the other hand there is much in Laudatio Si which does fall within his remit and is worth reading. Shame he didn’t stick to giving spiritual guidance to families and allowed himself to fall into the enviro-lobbyists’ trap! With all respect to the Guardian, but Laudato Si’ was never written for a North American audience. Pope Francis amended Catholicism to appeal to South Americans by embracing Pachamama (rather than Gaia); and to appeal to South Indians through Universal Communion, which implies that non-humans have a soul too. As to the environment, Pope Francis recycled material from environmental NGOs. Those who are susceptible to this message had already been convinced. The organisation 538, who famously fired Roger Pielke for telling the truth about trends in weather disaster losses, has a blog post refusing to accept these results. The truth is out there……….somewhere. Hi Paul, my comment just went down the rabbit hole……. When you’ve failed to persuade the world to follow the first ten commandments. why would you introduce on a new set? Religion has always been open to interpretation by those who can get away with it. What has changed is the number of people who can do what they like without punishment. I’m proud to say that the British are one of the world leaders in religious apathy. (I prefer the term apathy because true atheists are entirely too obsessed with not believing in god and use up too much energy going the other way). I don’t agree with that quote. People believe what they want to. which might be ‘anything’ but mostly they just don’t think about the issue at all. They don’t go to the church of B&Q because they have found a new deity, but because the tap is dripping or all the picture hooks are bent. Suddenly they have half a day more to spend however they like. All the more credit to those who do go to church because they choose to. I believe that when you sign up for something you sign up to the rules. I think it’s quite a British trait and why we couldn’t play the EU game very well. To some EU countries it’s very easy to agree to high ideals but turn a blind eye to flawed reality. The honour is in the promise. Climate alarmism seems to follow the same pattern but the public are too wary to join the religion and then find out what the commandments are. I doubt the public will ever sign up without knowing the costs and the warmists fear they’d never sign up if they did know them. What I am sure of is that there is no person on this planet that can command blind faith any more. Not a celebrity, not a politician and not even the Pope. I wonder whether we atheists (or apathists, to adopt TINY CO2’s useful idea above) haven’t got the status and influence of organised religion in society all wrong. We see the declining church attendances and think it’s all over. There are societies where 50 years ago the whole community went to mass on Sundays and now there’s almost no-one. But fifty years ago the Pope spoke only to cardinals. Now he can address crowds of hundreds of thousands whenever he wants, and his message is relayed to billions. Previously everyone knew what the church stood for because the priest told them every Sunday. Now everyone knows who the Pope is, much fewer where he stands on any particular issue. It’s a different kind of influence, more like that of a pop star. Everyone (except me) knows who Coldplay are. A large number may even know what they stand for, but not large enough to show up in opinion surveys, I’d guess. Likewise the number of respondents to this survey who had read or studied the encyclical was almost certainly near zero. What they were responding to was therefore not the Pope’s opinions but to something far less tangible in the big woolly cloud of their intellectual environment. I know social scientists are doing their best, but it often seems to me that their tools are hopelessly ill-adapted. Do they ever ask themselves why anthropologists don’t go in to the jungle armed with questionnaires about their respondents’ social class and political opinions? There is still a sizeable proportion of Catholics who instinctively believe everything the Pope says without question. This does not include those who have studied the history of the Papacy! One of the reasons, as I understand it, why Pius IX promulgated the dogma of infallibility at the First Vatican Council in 1870 was to put to bed once and for all the idea that the pope was infallible, full stop! Whereas, as I pointed out above, this only ever applies to matters of faith and morals and when addressed to the whole church. I think there have been about three infallible pronouncements in the last 150 years. So I agree about the “big woolly cloud of their intellectual environment”, combined with a (reasonable) belief that the head of an organisation which numbers its adherents in the hundreds of millions is likely to know what he is talking about, at least more so than the average pew-warmer! The fact that Francis was prepared to listen to Schellnhuber and ignore the advice of two of his cardinals that he should cast his net a bit wider suggests that on this subject he is certainly fallible and would be so even if it turned out that he was right! As noted above, the Pope is infallible (according to Catholic doctine) only when pronouncing formally (ex cathedra) on mattters of faith and morals. The rest of the time he is entitled to a respectful hearing (from Catholics, at least) and little more. ‘Laudato si’ emphasises our duties towards the poor, and how they will suffer most if the world warms up unduly. It doesn’t consider how the poor are already suffering the most from our efforts to stop the world warming up. It’s sad to see the Pope repeating the error of a predecessor – in intervening in a scientific controversy on the side of public opinion. The Pope does call for ‘honest debate among experts … while respecting divergent views’ (para 61). But he assumes he knows what the answer will be. Anyone based close to Winchester? 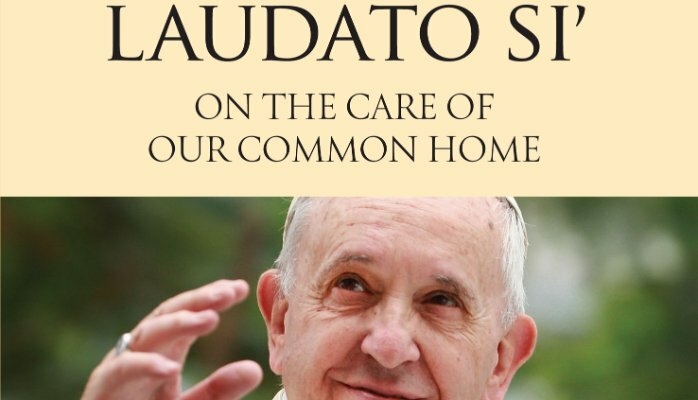 The Catholic Diocese of Portsmouth is holding a meeting there on Saturday 12 November to try to convince the general public (not just Catholics) to take Laudato Si seriously. I’m hoping the level of debate will rise above sneering at ‘deniers’. Some support for putting the contrary case (from the floor) would be welcome. No fee, sandwich lunch provided (modest donation for this appreciated). Winchester meeting – see my post above. if you didn’t come (as seems likely) you didn’t miss much. Plus points – a fairly high standard of discourse (‘debate’ would be overstating it). And the term ‘denialist’ was only used once – ‘deniers’ a few times, but not too objectionably. And one speaker said that although there were entrenched commercial interests, some people genuinely believed that global warming was not a serious problem. That however was the closest we got to any kind of review of the science – obviously such beliefs were not worth further discussion. We had three main speakers – who got 40 minutes or so each – and 6 or 7 ‘experts’ who got 3 minutes each. The ‘experts’ were from other ‘faith traditions’ – Anglican, United Reformed, Moslem, Jewish, Hindu and even an atheist. No ‘climate scientist’ – the closest we got was the Moslem, who was a surgeon, and the atheist, who was a biologist. Why would you need a ‘science’ expert? ‘The science is settled’, and anyone who doubts that we are necessarily headed for disaster is clearly a wacko, and can be ignored (and was). Questions were selected for discussion after lunch, from among those written on Post-it notes. None of the three mildly sceptical questions I put in made the cut. First question of the morning from the floor – what are we to do? This was repeated as the last question of the day – most rational answer, Turn Vegetarian. But I shall send the chairman of the meeting a one-pager explaining what science is settled and what is not. I may or may not get an acknowledgement. I also gave a copy of this to the most rational of the main speakers – who accepted it graciously, and may or may not read it. Oh – and one item of news – from a chap who spoke about the Paris conference, who though not sensible seemed well-informed. There was a case in Ohio, decision came out last Thursday, in which a number of ‘young people’ were suing the United States for infringement of their constitutional rights to a ‘stable climate’. The appeal court refused to throw it out – so that will now go to trial. See http://www.ourchildrenstrust.org/press-releases/ (if you have a strong stomach). Note the “have …damaged”. So they need scientists to stand up in court and swear that life threatening damage has already occurred. “guardian in the case for all future generations.” Perhaps a countercase could be mounted on the grounds that he is not a fit guardian, and that future geerations should be taken out of his care and returned to their natural parents? For those who hadn’t heard, the foreword to The Laudacity of Pope was contributed by none other than Naomi Oreskes. Just going to prove that behind all complete bull is an utter cow. So there will be expert witnesses on both sides – with an obligation to give evidence under oath. Read the inestimable and much-missed Michael Crichton’s “State of Fear”. ‘Young people’ are far too stupid to sue responsibly. One can only hope the inevitable embarrassment of this children’s crusade in court will spur reforms to the suing age, which (currently set at just 18) has made the world’s top country an international giggling-stock for too long.